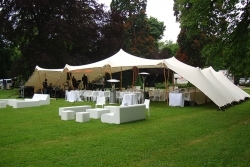 Stretch marquees are spectacular for weddings, corporate events, stage events and private parties. Their adaptable functionality make them a highly versatile way of covering many unique spaces such as gardens, terraces, patios and swimming pools. Anchoring to almost any surface, we can also provide side walls to protect from the elements, or leave the sides raised for both open and intimate feel with rustic wooden poles inside to suit natural surroundings. Stretch tents have beautiful lines which provide a stunning way of creating an outdoor space that perfectly matches the atmosphere, theme or special event that you plan to hold. Get in touch with us here for quotation.